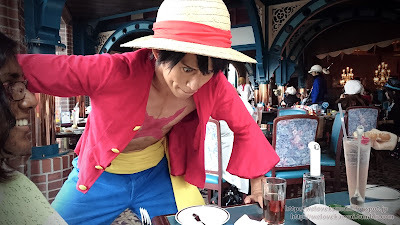 Close encounters of the live-action kind - This is one of the few attractions where you can see the One Piece actors up close. Unlike Shrek, Princess Fiona or Elmo, the One Piece characters won't be found wandering around the park, as I'm sure that would cause too much of an uproar. You don't want to get caught in a crowd of fans trying to get a photo-op with their favorite character. Things could get quite ugly. A hungry, wild Luffy appears! Photo-op with the crew - This is the only event where you can get a photo with the One Piece actors. A few years back, you were able to take photos during the Premier Show, and with proper timing and some luck, you could snap a selfie with a character from the show in passing. But now photos are no longer permitted, leaving this event as the only other photo-op destination. All photos are taken by staff on one device (camera, smartphone, etc.) along with another shot on a USJ camera. You're welcome to purchase the USJ photo (for about 2000 yen) complete with a memorial (paper) frame. A great show with a great seat - Unlike the Premier Show, where you could end up positioned behind one of the massive theater columns, or so far from the action that it gets difficult to see characters, every seat in the restaurant is a great seat. All of the characters will pass by your seat, or even interact with you, at some point during the event. And at the end of the event, everyone gets high-fives from the characters, and I mean EVERYONE. 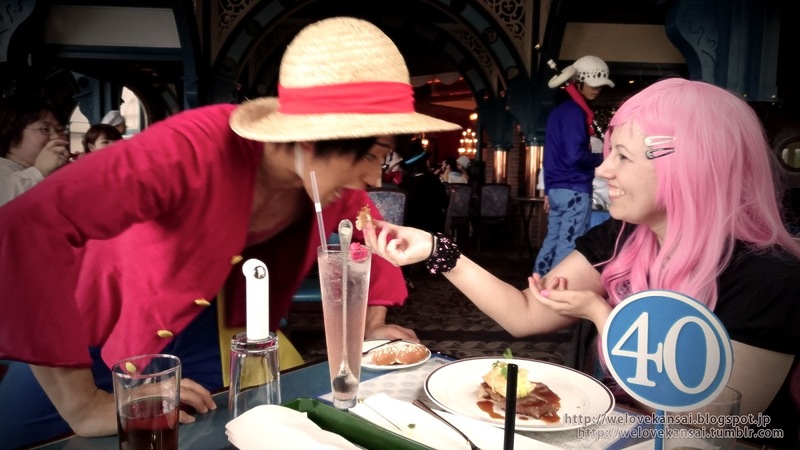 A unique One Piece restaurant experience - An original story involving the characters was written and then recorded by the voice-actors, resulting in a really unique experience for fans. Actors miming along to a voice-track may sound... well, a bit hanky, but it actually works really well! They really bring you into the performance. 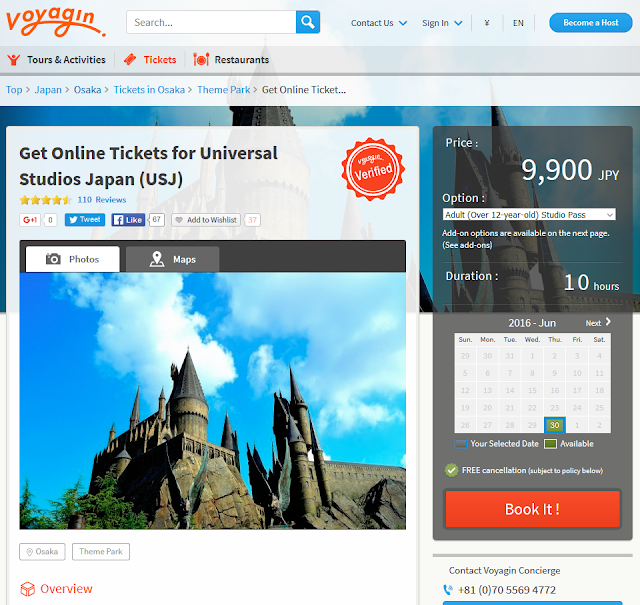 Overlapping with other events - Unless you're well-versed in events at Universal Studios Japan, you might find that your restaurant time overlaps with other events, maybe even with the Premier Show! Unfortunately, refunds are not offered for the restaurant, so you'll have to forgo other events if an overlap does occur. With the Universal Cool event, they offered packages that prevented attractions from overlapping, but I suppose the sheer volume and of guests at the One Piece events makes that impossible (and the fact that some events only occur once-a-day). Things to note for next year's event (as this year is completely sold out): buy your tickets and pick early times. 12pm seems to be a sweet spot! Sells out quickly - Unfortunately, Sanji's popularity with the lad-- I mean, this event's popularity means that it sells out. Fast. Early times were all but sold out by early July (not long after the event began), with all times being sold out by the end of July. This is actually much slower than last year, owing to the fact that there were more show times (see overlapping above) and they didn't allow tables with 1 person, but if you're only going to be at USJ for one day, I wouldn't take my chances on waiting. Try to get your tickets the day they go on sale (updates are usually given out on the USJ Twitter or Facebook page). Your oh-so-fab (paper) menu! Made with love, I'm sure. That's an extra 4980 yen to your USJ trip - Yeaaaah, but you have to remember, this is more like a lunch/dinner-show, so you're not really paying for the food, you're paying for experience. But the food isn't bad! As you can see, the pros definitely outweigh the cons and I would highly recommend this event to any One Piece fans visiting USJ in summer. To be quite honest, it's one of the factors that lead to me buying a season pass these pass two years as it all but guarantees I'll be going to USJ more than once (I have a lot of friends who like One Piece >_>;; ). It's also an event that I recommend to EVERYONE when I talk about USJ. 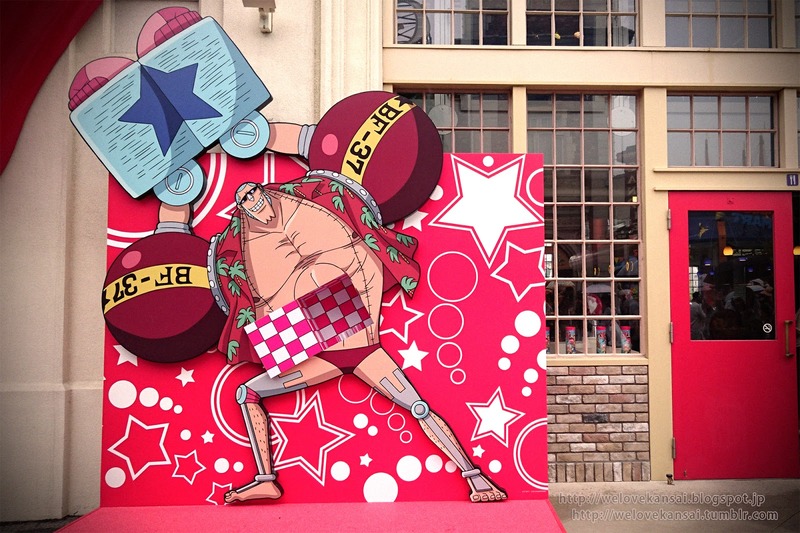 It's basically one of the best things USJ has going for it, so I just hope they don't... well, ruin it. Guess who's gettin' paid out in front of the Coca-Cola Happiness lunch room. You can has all the One Piece characters - The Premier Show is where you will get to see the largest number of One Piece characters, all in one place. This year alone had the Mugiwara Pirates (Luffy, Zoro, Nami, Usopp, Sanji, Chopper, Nico Robin, Franky, Brook), Kin'emon and Momonosuke a la pink foam dragon, Bartolomeo, Cavandish, Sabo, and Ace, quick one-liners from Doflamingo and Law, baby Luffy, Ace and Sabo, plus several side characters and some created just for this show. And, of course, all the series characters are voiced by their respective voice actors. Also, just a note about this year's show, Bartolomeo was amazing!! 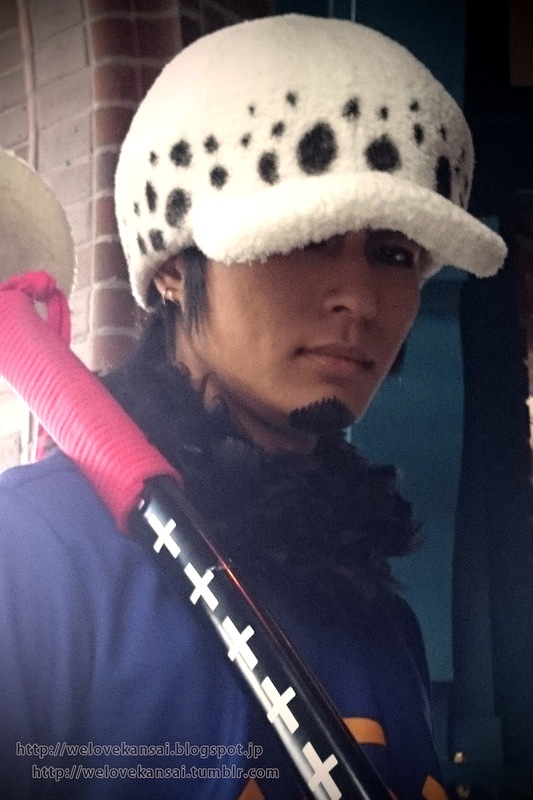 His actor made me love the character even more than I had before (excuse me while I collect all the Bartolomeo things). A well-performed event - As this event is not included with park admission (a separate ticket must be purchased online or in the park), this should be a given, but I do believe they try to exceed expectations with this show. It's held in the Waterworld venue, so I originally assumed it would stick to the tricks used in that show, but they've invented quite a few new tricks that make the show unique to USJ and One Piece. And every year, so far, it gets better! Here's to many more, we hope? Forking out more money gets you a better seat - Wu-Tang said it best, and never is it more true than at this event. If you spend the extra cash for a S1 seat, then you'll be front and center. You may WILL get wet, but you are mostly guaranteed some kind of interaction from the actors and all the high-fives. Anything below the S1 seat, and you may be left to watch the S1 and aisle S2 seats in envy as they hang out with all the characters in the show. So if you've got the money, and want to get close to the characters, I recommend a S1 seat. Tickets go on sale for members first - Not only are they only on sale for members first, there are various tiers to this membership (VIP season pass holders, Universal Club members, then general public is what I recall) that means all the good seats could be gone before tickets are for sale for the general public. If you're vying for a seat, I suggest becoming a Universal Club member (free and you will have to do if you purchase tickets online), that way you'll be notified by e-mail about upcoming sales and events. No photos allowed - Unfortunately, or fortunately, photography is not allowed at this event any longer. The first time I went, photos were allowed, and while it was okay, some guests would hold the camera above their heads, blocking the view of other guests. I guess instead of telling people not to do that, they decided to just do away with photos all together (though I did read on some sites that it may have to do with voice actors being used, and not being able to manage the rights to their voices on sites like YouTube, etc, and along with other bad manners associated with people taking photos). No English information - I've lived in Japan for about 5 years, and also work as a translator for a company, but believe me when I say that it is incredibly difficult to understand voice work, even when blasted through expensive speakers. I only, very vaguely and after multiple inquires to a friend, understood some of the dialogue between characters, forget trying to follow the narrator. Luckily, the action alone if fairly easy to follow, if you're already aware of the characters' relationships with one another, so it's not a deal breaker, just something to consider. There is such a thing as a bad seat - Whatever you do, try to get a seat not directly behind a column. Sadly, the design of the theater leaves a lot of folks with a poor view at times, but if you can, stick to seats in the middle of the theater, or to the sides. Also, anyone seated in the middle of a row won't be able to get a high-five from characters as they run through aisles. This disappointed more than you know because I really wanted a high-five from Usopp ;n; (his actor is the most adorable!). While this event has many merits on its own, it is really hard, nigh impossible, to not compare it to the restaurant, and thus, the rating is just average. Especially when you compare prices, proximity, and what's included with the price of the tickets to each event (the cost of an S1 seat is the same as the restaurant). BUT, if you're unable to get your tickets to the restaurant, you might as well blow that money on an S1 seat for the Premier Show. I guess (though it seems all of those seats MAY be sold out for this year sooo... next year?). Would I recommend this to fans of the series? Absolutely! There's no way to not enjoy yourself at this event. Would I recommend this event to fans who don't have tickets to the restaurant and show? Uh, maybe. If you'd like to take photos around some of the One Piece stuff decorating the park (though it's quite turned down this year) and get your hands on some cute One Piece gear, then it's still worth the park's entry fee (plus there's always Harry Potter Land if you get bored). Would I recommend this event for those that aren't necessary fans of the series, but still sorta interested (and without aforementioned tickets)? Uhh... probably not, and even if you got the tickets, that's a almost 10,000 yen (close to 100 USD) extra to your already pricey park entry fee (it's 7,200 yen to get in). You'd really have to evaluate how much you like the series. If you were going to to USJ anyway, and just happened to find out about the One Piece bit, then it's still a win, but if you're going just to see what they have, much like the Universal Cool event, you might just end up bored. If you really wanted to see the One Piece show and restaurant, unfortunately, you'll have to catch that wave next year. Might I suggest you take that 7,200 yen and use it at Abeno's Mugiwara Store?? That place is totally worth it! Questions, comments and concerns always welcome!